Last Saturday I did what I have never done before: I bought wine through the internet. Through facebook I found Bacchusonline. I ordered three bottles, some random selection basically, so that the total value was above Bath 2,000. In that case, Bacchusonline said that they would deliver for free. This was done at 10 in the morning and at 16 h we had our three bottles deliverd. We paid cash and that was it. Fantastic. What great service. In another post I will tell you what I bought. While in transit at Frankfurt airport I picked up a bottle of German Riesling. I just could not help it. The ‘2011 Dr Loosen Blue Slate Riesling Kabinett’ was just too tempting. i forcked out eleven EURO and the bottle was mine. It only has 8% alcohol which is pretty low. This off-dry wine would go very well with spicy Asian food, I thought. And so it was. 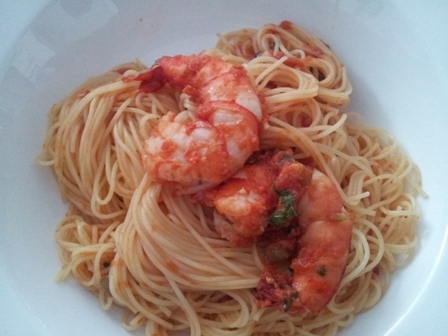 In the end I had it with a spicy prawn pasta. What a wonderful sensation. This mineral driven semi-dry Riesling from my native and beloved Mosel river was the perfect match to the soft chillies used for the pasta. The fine acidity with the remaining sweetness of the Riesling was mouth watering, refreshing and extremely pleasant on the palate. I was glad that I did not go for a bone dry wine but instead opted for a “Kabinett”. And I have to add that I usually avoid off-dry wines. A salute to Dr Loosen and his fine wines from the Bernkastel region along the “Mittelmosel”. Since a long time I want to write about my favourite “watering hole” in Bangkok. It is a small and unassuming place in Soi Ekamai, just a couple of meters from my office. I pass by there every day when walking to and from work. 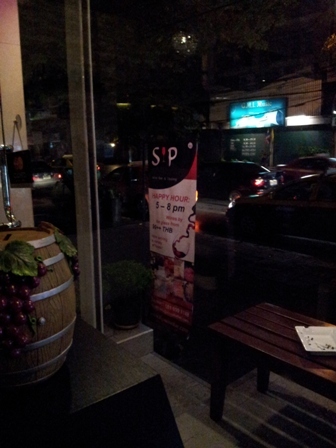 It’s name is SIP Wine Bar and Tasting. Victor, the owner and manager is a great guy, passionate about wines and extremely knowledgeable. SIP offers value for money. 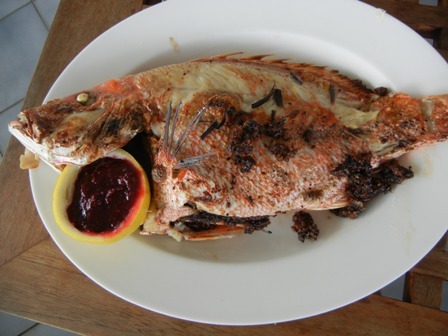 So it is no wonder that tripadvisor gives it 4 1/2 stars out of five. The other day when we were dropping in for a quite evening sip, we found ourselves in a large group of customers. The place was choker blocker full because the Bangkok Wine Club and about 30 of it’s members had flocked to SIP for their monthly get together. We met some interesting people and had some interesting conversations. 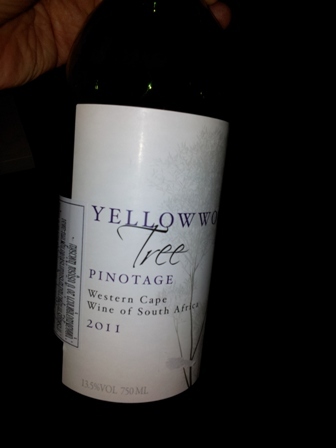 The ‘2011 Yellowwood Tree Pinotage’ from the Western Cape in South Africa was a medium bodied wine with nice fruit aromas, a wine for easy drinking. Victor has a good collection of wines from all over the world. Moreover, given the fact that wine prices in Thailand are astronomical (among other because of the high taxes), SIP offers value for money. You will not regret it. I suggest you check it out yourself. 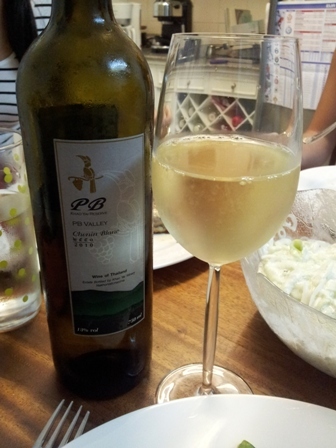 One of my favourite Thai wines is the ‘2010 PB Valley Chenin Blanc’ by PB Valley Khao Yai Winery in Khao Yai, Thailand. This wine was awarded a Bronze medal by Decanter earlier this year. It has a good acidity and a nice freshness. 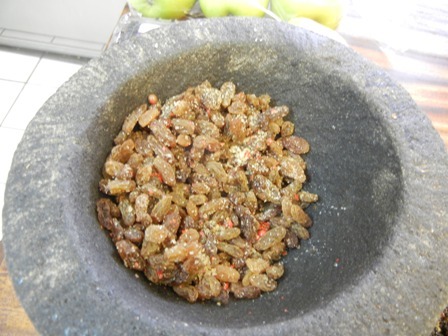 The tropical fruit flavours are refined and not overpowering. It is amazing that this grape variety from the Loire Valley in France is growing so well here in the tropics. 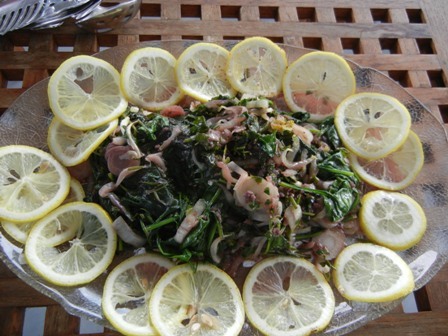 We had it with a white fish and a salad made from various vegetables. The wine was a perfect complement. Look out for this wine. It’s very good value for your money. You can buy it here in Bangkok at the Great Hornbill Bistro in Soi Sukhumvit 39. The other day I picked up two bottles of Australian wine at Beijing International Airport. I was in transit and browsed through the duty free shops when I saw them. First I thought them a bit pricy, but then I decided to take two, one white, one red. The white wine was a ‘2010 Steingarten Riesling’ by Jacob’s Creek. Some wine critics call this wine a ‘benchmark of Australian Riesling’. Usually, I avoid buying Jacob’s Creek because my wife hates the brand. For her it stands for cheap mass-produced wine. During our time in Beijing in the early nineties there was only cheap Jacob’s Creek available in some selcted shops. Ever since she does not like the producer. 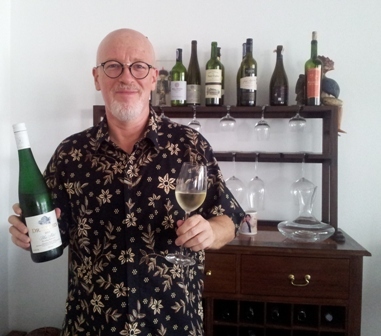 However, I had heard about “Steingarten”, maybe one of the best Riesling terroirs in Australia. And because I am still searching for my favourite Australian Riesling, I thought to give it a try. The original Steingarten vineyard is located at Trial Hill in the Eden Valley, South Australia. 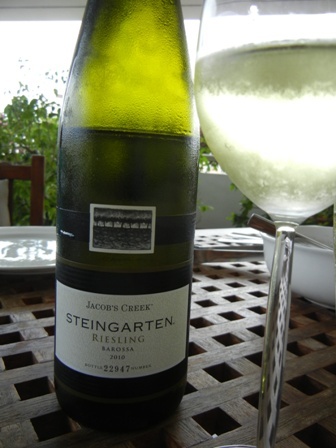 “Steingarten” is German and means “garden full of stones”, but in the case of Jacob’s Creek its a brand name. The wine is “cool climate” and the grapes come from selected locations at higher altitudes of the Barossa Valley. The bottle had even an individual number (I bought bottle number 22947); and it was low in alcohol (12.5 %). I paid about 25 EURO for it which is not cheap. In my native Mosel valley there is plenty of first class Riesling around for such a price. The wine was not bad. It had the normal Riesling aromas (lime, citrus and green apple in this case), a solid structure, fine acidity and a good finish. However, I must be spoiled by the German kind of this wine so that also this one did not trigger my enthusiasm. Needless to say, the search for an Australian Riesling which satisfies me is going on. The bigger disappointment was to come: the food. Of course we had the wine with food. 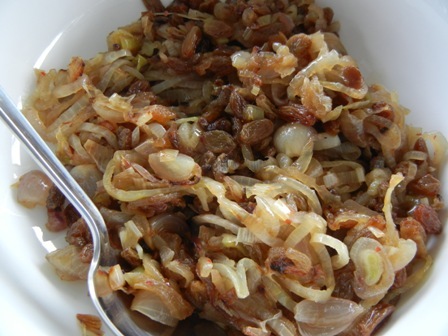 Shakespearean cuisine was the go, which is a rather sweet affair with lots fo figs and raisin. 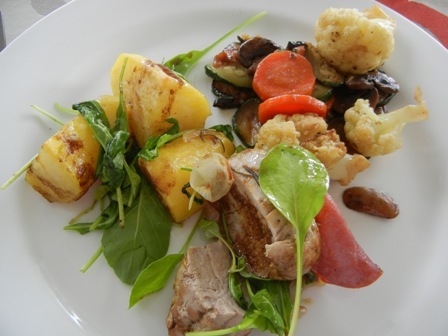 Every individual dish tasted interesting. 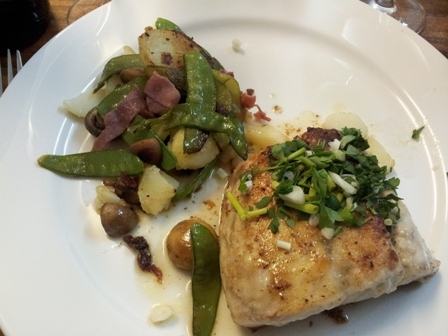 But we made a basic mistake: the various dishes did not harmonize at all with each other. 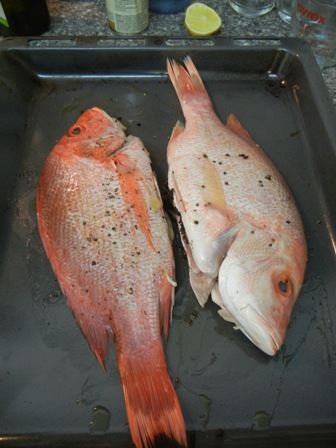 I will just show some pictures and spare you the details of the dishes. After a recent business trip to Brussels, I had the chance to visit the old trading city of Antwerp, the capital of the province of Flanders, just about 45 minutes away from the Belgian capital. It was a rainy day with some sunny parts. I made the best of it. The city on the right hand side of the river Scheldt has a long history and one of the largest seaports in Europe. The old guild houses in the centre are just a marvel. 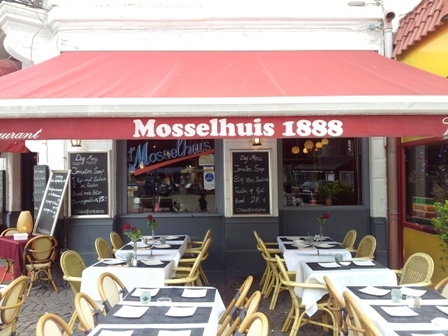 But I will have to come back to have lunch in one of the “Mousselhuis”, and eat mussels. The place above was so inviting. It made my mouth watering. Unfortunately, I did not have sufficient time. Well, such is life. 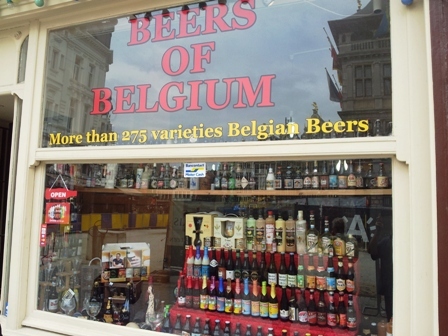 Belgium is among others famous for its beer. Here of course Germans have their problems. Everything not brewed according to their “Reinheitsgebot” – according to German purity standards only hops, malt and water are allowed in the brew – cannot be called beer. But here we are in Belgium, right, so other rules apply. The labels promising cherries and other fruit in the beer are not very inviting to my taste. However, I had quite a few nice beers during my short stay. The best was maybe the dark Trappiste beer (10.2 % alc.) which was offered to me by my friends parents. It came from a bottle without a label, only a rim which had the name of the monastic order engraved. I found out later that this beer comes from the Westvleteren Brewery. It was the first day with the family after an extended absence from Bangkok, and we all enjoyed a hearty meal together. The wine I had brought with me from Brussels. We were looking forward to it. As you know, I am not very knowledgable as regards French wines. But first, let us see about the food. 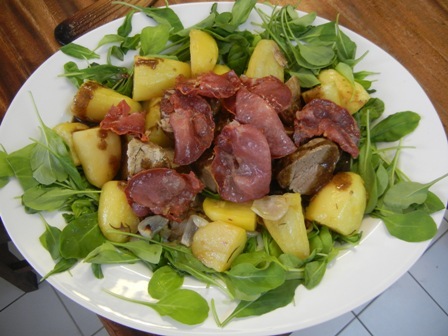 We had some pork loin on a bed of rocket sald and potatoes topped with some bacon. This was super delicious. 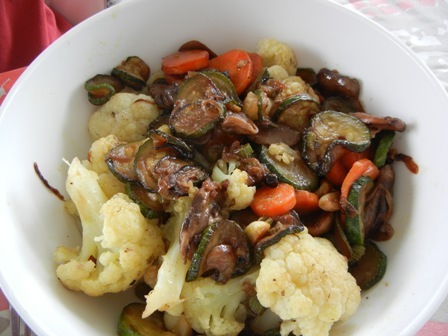 As side dish we had some assorted vegatables consisting of zucchini, carrots and cualiflower. As mentioned above, the wine came from a supermarket next to my hotel in central Brussels. 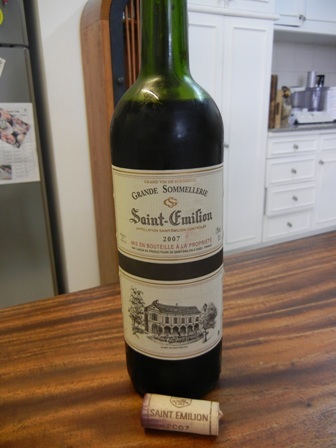 I choose the most expensive bottle on the shelf, and voila it was a ‘2007 Union des Producteurs de Saint-Émilion Grande Sommellerie’, a blend of the five traditional Bordeaux varieties (Cabernet Sauvignon, Merlot, Cabernet Franc, Petit Verdot and Malbec). I had no idea who the “Union De Producteurs De Saint-Emilion” was. 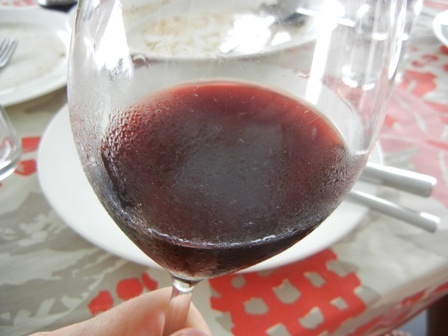 However, the wine was dark and full, a bit like jam, full of red fruit flavours. It has a good body and a reasobale long finish. In short, it was no disappointment. Conclusion: I do not sample sufficient French wines, and should drink more of it. You are currently browsing the The Man from Mosel River blog archives for June, 2012.